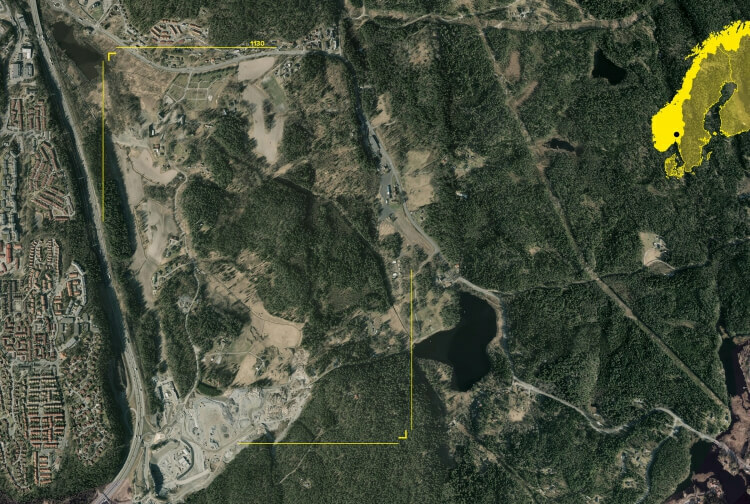 As one of the last and largest development zone in Oslo, Gjersrud Stensrud is under great pressure. To be able to create a balanced living environment close to nature, it is essential to ask our self what areas should and should not be developed. There should be an ambition to make this new district a better living environment than before for animals and plants with the new development. We don’t envisage the masterplan to become one huge neighbourhood, with one overarching character but rather a variety of identities inspired by local conditions. The predominant urban character of the area is defined by new types of two and three-storey, ground-accessed houses deviating from the usual terraced house in being strongly oriented to the private realm by incorporating patios and roof gardens. Facing the tramline, the housing can accommodate live/work spaces, atelier spaces etc. The proposition is to have a large variety of lifestyle possibilities. In some types, the The main house is separated from the car porch at the rear of the site by a glass house which can harness, store and distribute the energy of the sun to maintain a comfortable living environment throughout the year without the need for expensive equipment. The typological driver for the center is to establish a quite environment by building a series of small, quite spaces away from the main roads. A consistent line of town houses defines the entry route into the quarter. The interior of the blocks are characterise by two storey garden houses. The typologies respond to the topography in a very particular way that defines the built form and the character of the area. Homes and gardens negotiate the topography through a series of stepped earth platforms. A series of solid walls and green edges cluster houses together to form the boundary of each of the lanes. Changes in level across the site are incorporated into garden walls and typologies so each lane is at a different height. Strong boundary walls clarify the relationship between public and private realm. These staggered spaces create small and linear neighbourhood squares with an informal character. The walls are of different heights in order to respond to a range of parameters that allow passive surveillance, security, views and consistency. The landscape concept incorporates public space, car parking and planting into a simple but subtly different environment. This area is the first phase development. The neighbourhood provides an exceptional environment for housing surrounded by the natural habitat. The site benefits by being close to the exiting lake and wetlands. The design for the centre demonstrates that the compression of traditional low-density suburban row housing into a more compact urban model can produce intimate and intriguing spatial solutions, reminiscent of traditional village settlements. The houses are conceived as simple generic forms but they have hidden depths and complexities. Roof terraces and patios are cut into the houses to compensate for the small gardens. Living rooms are raised to first-floor level to benefit from borrowed, diagonal views. Cars are incorporated in the houses to reduce on-street parking. The ‘regular irregularity’ of the plan layout accommodates the high density of houses while maintaining openness, social policing, views, play areas for children, shortcuts and a general feeling of village cosiness. The centre is characterised as a contemporary ‘hill-town’. Clear building edges establish the character and feel of the main public spaces. A network of public squares, promenades, mews, courts and lanes intensify the spatial diversity. The arrangement is organised to ensure that every dwelling gets a view of the surrounding farmland or hill-side. Pedestrians and cyclists have priority in the narrow streets and small collective courtyard spaces between buildings. Collective parking is organised below the blocks. A catalogue of options would allow residents to expand and customise their homes during and after the building process.